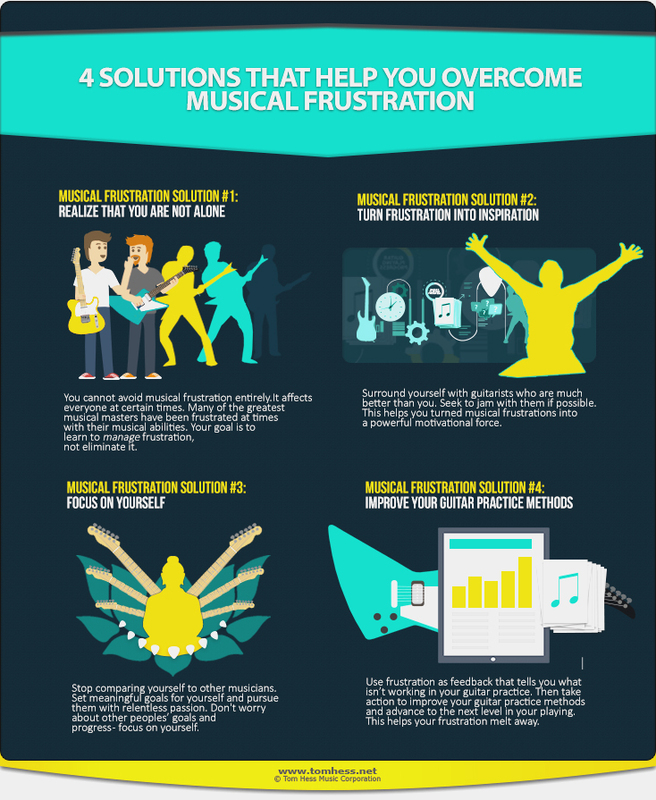 You reach your musical goals faster when you learn to manage your musical frustration. All guitarists occasionally feel frustrated with their guitar playing and musical progress. The majority let their frustration overpower them. They quit playing guitar and quit striving to reach their musical potential. The rest continue to persevere and become great musicians. To overcome musical frustration, develop consistency in your guitar practice habits. Practice guitar every day (or as close to it as possible). Building consistency becomes easy when you set aside a specific window of time for guitar practice every day. Build the rest of your day around your guitar practice, vs. trying to fit guitar practice into your day. Consistent guitar practice makes you progress much faster and builds momentum for great results in your guitar playing. Learn other principles of guitar playing greatness. Take guitar lessons on the internet to overcome musical frustration and become a great guitarist fast.